With a neurologist directory, therapy options page, and connections to multiple support groups, FoundationForPN.org is a great tool for anybody suffering from nerve damage. The website incorporates the best of practical guides and information with news and research to bring site visitors comfort, and knowledge. Those interested can also sign up for membership with the organization directly through the webpage. Patient.info provides neuropathy sufferers with access to an abundance of information. Providing data on psychology treatments, alternative therapies, side effects of neuropathy medications, and common causes of nerve pain, the site is easy to navigate. It also offers a unique patient discussion area, where you can talk to others who suffer from neuropathy, and discover which routes they have taken to achieve pain relief. MedicineNet.com sets itself apart from other medical sites by incorporating a patient area for quizzes and photos affiliated with neuropathy and similar disorders. The site offers information on causes, diagnosis, treatments, and symptoms, along with patient comments, and a number of slideshows which dive further into chronic pain, nerve damage, and neuropathy as a whole. Medscape.com supplies a medical overview by doctors for doctors. The page on neuropathy covers areas such as anatomy, epidemiology, and prognosis, as well as patient education and pathophysiology. Visitors to the site can view a workup and full presentation on the disease, before researching treatment options. The neurology page as provided by HopkinsMedicine.org is aimed towards those who are suffering from the ailment due to complications arising from HIV. It describes the effect of the disorder on peripheral nerves, thoracic nerves, cranial nerves, and autonomic nerves. Other forms of neuropathy information provided by the site include those related to diabetes, Guillain-Barre, and cancer. Foot.com explores neuropathy as it relates to the feet and toes. It covers a number of causes, treatments and symptoms to be aware of, and recommends products to use in shoes and separately for immediate, short-term relief of pain and numbness caused by this type of nerve damage. Drugs.com offers disease references, but focuses majorly on the medications available to treat neuropathy in its many forms. Visitors to the site can read about different drugs, the relief offered by them, as well as side effects and costs associated with each. Remember to always refer to your physician before using any new medications. While LiveStrong.org mainly focuses on neuropathy as it applies to cancer related issues, it also covers causes such as thyroid dysfunction, nutritional deficiency, and as caused by previous treatments and medications from illnesses. It holds answers to coping methods and strategies, and dives into the ways that nerve damage can affect your life overall. A subsidiary of the National Institutes of Health, this site focuses on neuropathy as it relates to the nearly twenty million Americans who suffer from it. Visitors to the site can navigate through neuropathy classifications, symptoms of nerve damage, as well as the diagnosis procedure. Each subject is thoroughly explained, and includes contact information to the institute for those who need further information. WebMD provides answers to various health concerns through the professional assistance of editorial staff which is overseen by real medical doctors. The site contains data on everything from cancer to pregnancy, and provides insight on diagnosis, treatment, symptoms, causes, prevention, and news related to each illness or injury. The neuropathy page offers access to pain management techniques, as well as facts, and reference materials. This page delivers information primarily relating to nerve damage caused by diabetes. Here, you can explore methods of prevention, as well as additional forms of neuropathy, and patient specific materials for those currently suffering from the disease. The website also hosts a number of information and links relating to other diabetes symptoms and treatments. The Mayo Clinic provides information on various diseases, illnesses, viruses, injuries, and more. The site’s page on neuropathy not only outlines the basic treatment options, but also delves into insurance inquiries, patient stories of those who are dealing with the ailment, current clinical trial, and other research which is ongoing. Visitors to the site can also request an appointment to speak to a medical professional from the comfort of their homes. MedicalNewsToday.com covers a multitude of medical subject matter from Alzheimer’s to urology. By selecting neuropathy from the alphabetical index, or by using the search bar, visitors to the site can follow up on relevant news, including new research, studies, and possible treatments. An overview of the dysfunction is also available to those seeking general information on cause, treatment, and prevention. HealthLine.com includes an overview of neuropathy, along with the subcategories of symptoms, causes, diagnosis, treatments, outlook, and prevention. Each is loaded with information, which provides clear and easy direction along each step of the journey from prognosis to medication, as well as alternative forms of therapy. The site is easy to navigate, complete with a search bar, and large headers. 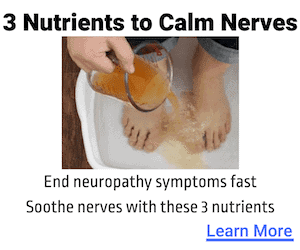 Nerve Renew is purchased as a bottle of supplements, which contain a number of necessary ingredients for the management of pain associated with neuropathy. Vitamins in the bottle include B12, D, and alpha lipoic acid, among others. The formula reduces the sensation of tingling, numbness, burning, pain, and anxiety, while heightening coordination and increasing nerve support. Each bottle has a one-year money back guarantee, and can be obtained in a trial basis for two weeks. For more information on neuropathy or Nerve Renew, we invite you to browse through other pages of our site, or contact us directly. At NeuropathyCure.org, we are dedicated to the research of neuropathy in the hopes of one day finding a long term solution or cure.